I have been waiting for and planning for this day for what seems like an eternity (okay, it’s only been eight months), and it’s finally here. Every time we thought we were going to be able to do this over the last eight months, we would find that the money we had saved for it had to go towards other things, but we’ve finally made it happen, and I’m so stinkin’ excited!! The other day I mentioned my excitement, and I said that after today, things would be full steam ahead. I didn’t necessarily mean that I’ll be picking up the pace on my projects. Quite frankly, I’m not sure that I possess the strength or stamina to pick up the pace any faster that what I’m doing now. So let me answer the most-asked question I’ve gotten over the months regarding the house leveling. What the heck does it mean to have a house leveled? Right after we bought our house and I mentioned that we needed to have it leveled, I got so many concerned comments and emails from people who literally thought we were tearing our house down…leveling it to the ground…razing the whole darn thing. The concept of “leveling a house” is so common in this part of the country that I never knew that there were parts of the country where this concept was completely foreign. So the concerned comments and emails kind of threw me for a loop at first. So here’s an example of a pier and beam foundation from Mike Whitecotton Concrete in North Texas. On most pier and beam foundations that I’ve seen (but certainly not all), the outer perimeter of the house has a solid concrete “wall”, and then inside that perimeter, there are piers (which can be made of concrete, or concrete pads with wood supports on top) spaced evenly throughout. These piers have to be level with the outer concrete perimeter, because it’s upon these piers that the beams will be placed that support the floor joists. 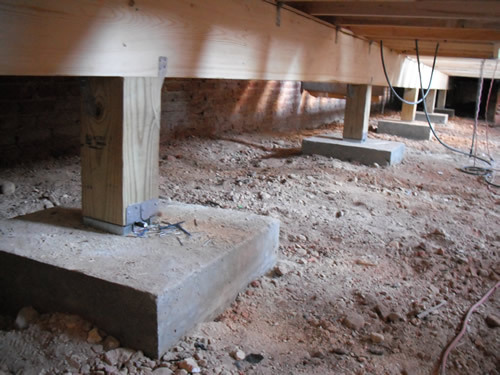 Here’s an example of a pier and beam foundation that uses concrete pads and wood piers from Four Brothers Carpentry in Washington, D.C. You can see how the long beams spanning the piers support the floor joists. But what happens on these old pier and beam houses in some areas of the country is that the ground beneath the house will start to shift over time, and as that happens, some of the piers upon which the house was built will begin to sink and/or shift. 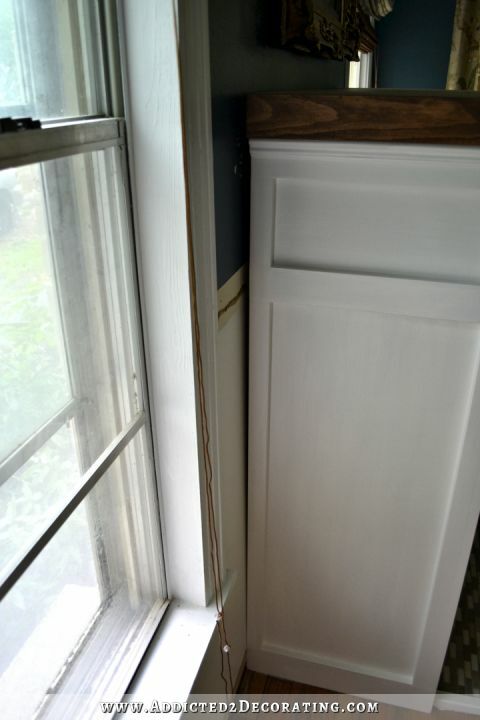 Generally that shift is slight, but just enough to cause doors to stick when opening and closing, and walls to form hairline cracks (generally above doorways), and items such as spray paint cans to roll away from you if you drop them on the floor, and cracks form between bricks or stone on the exterior of the house. 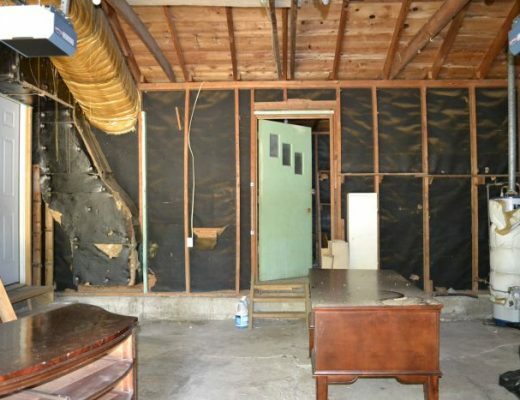 In rare situations, the shifting can be quite severe, causing major structural damage to a house. But again, those situations aren’t common. Most of the unlevel areas in our house are only noticeable when I drop something on the floor and it rolls away from me. Or when I try to build something that sits right against the wall, like the fireplace, and it won’t sit right up against the wall because the floor is unlevel. But it’s really not very noticeable when you’re walking through the room. However, we do have one place in the house where it’s very noticeable when you walk through. We basically have a very high point that goes from our front door straight through to the door that leads to the sunroom. How are old unlevel pier and beam houses leveled? Well, I’m not an expert, and I’ve only seen it done once, so I’m sure this is one of those things where there are several ways to correct the problem. But in our case, I know for sure that there will be “shims” added to the piers that are too low. My understanding is that they’ll get underneath the house with a hydraulic jack of some sort, and working room by room, they’ll raise the low areas until they’re level and then add metal shims underneath the beams. In some areas, it may be necessary to add additional concrete pads and blocks. I’m almost certain that this will be necessary in our kitchen, for example, since I’ll be adding a great deal of weight to the floor when I pour the concrete countertops in there. And at times, it may also be necessary to replace beams if the original beams are twisted or rotten in places. So what’s the cost for all of this? Once they get under there and can see what they’re working with, they’ll know if they need to add concrete pads and blocks in any areas. If they do, each new pad/block will cost $175. And in the event that we need any of the beams replaced, those will cost $18 per linear foot. Of course, those prices are just to give you a very general idea of how much leveling a pier and beam house costs. But I’m sure the prices can vary greatly depending on a number of factors, such as (1) the company used and the experience and reputation they have, (2) the part of the country in which you live, (3) the construction of the house (i.e., a single level house with no basement vs. a multi-floor house with a basement), etc. But I’ll be ready and waiting with camera in hand just in case I see something interesting that I think might be helpful and informative. I do know that house leveling can be a DIY project if you’re willing to crawl under the house and lug heavy stuff under there with you, like concrete block, metal shims, and a hydraulic jack. When my brother bought his first house many years ago (I think it was in the 80s), he and my father leveled the house themselves. But it’s definitely not a one-person job, and you’ll certainly want to do your research and really be confident in what you’re doing before you start. Because if you don’t now what you’re doing, you can cause some really serious structural damage to your house. For me, this is one of those things best left to the pros. And they’ll be here shortly! Wow what a huge job. I cannot believe what you take on, woman! It’s quite amazing. I might not love every single thing but I am ALWAYS amazed by your drive and abilities. I hope when my kids are a little older I can learn more of these things.. power tools, electrical.. plumping. All that good stuff. I am still doing what I can, but it pales in comparison. Why are the houses built like this anyway? surely these aren’t safe in tornados earth quakes etc? in the uk houses are build on foundations, which are made up of about 5ft foot of concrete! houses are built with breeze blocks and bricks!! timber frames are a new thing here or maybe they are only just being used again after the great fire of London!!!!!! I think that it’s probably a combination of expediency and cost control. And sometimes you just can’t keep up with what the earth is doing–I’ve seen even big foundation/steel frame construction damaged by drought, the ground drying up and shrinking causing things to twist. Kristi, congrats on a major hurdle finally being crossed! Pier and beam houses actually cost quite a bit more to build and take longer to build than slab foundation houses. Slabs are much cheaper and faster, which is probably why contractors find them preferable these days. (I’ve never met a contractor/builder who didn’t look for every single way to do things faster and cheaper.) 😉 Having lived in both, I would only ever choose a pier and beam. So many advantages to it. As a matter of fact this is really best here in TX because of the dry vs wet conditions. When on a slab you can’t truly level it and have to add piers outside the house and then do tie in’s. We looked at a house like this where the brick had separated and it would cost 10 grand to fix it. End of story, we opted out of that one. They are absolutely safe in earthquakes. Its a very common way to build in Alaska. And it makes leveling a house much simpler, then having to mudjack it, in case settling does occur. I happen to live in a part of the country that is called “Tornado Alley.” While I’ve only ever been directly in one tornado in my life, I’ve experienced tornado warnings countless times, and I’ve seen (in person) the aftermath of tornadoes in and around the area where I live. I can assure you that a tornado can and will rip a house right off a slab foundation just as easily as it would rip a house off of a pier and beam foundation. I don’t live in an earthquake-prone area of the country (I don’t think we’ve ever had an earthquake here, even though we’re right on top of the San Andreas fault line), so I can’t speak personally to the differences in an earthquake, but I would imagine it’s much the same. If the earth is rolling, buckling, and splitting apart beneath a house, I can’t imagine how a house on a slab foundation would be saved. That foundation would crack and buckle right along with the ground underneath it. Pier and beam foundations have been used for 200+ years in this country. Slab foundations are relatively new (I think they started using them in the 50’s in this part of the country), and they’re much cheaper and faster to do. Pier and beams actually cost considerably more to build and take longer, which is probably why so many contractors these days won’t build them. Pier and beam is actually preferable in some parts of the country, especially those areas with particular types of soil that move, expand, and contract. They’re also preferable in certain climates. When I lived in Oregon (the Pacific northwest), I don’t think I ever saw a house being built on a slab foundation. Every single new construction house I saw built there was on a pier and beam foundation. I would imagine that has to do with the climate — it rains nine months out of the year there, so having a foundation that sits right in the soil could be very problematic. But having lived in both (the house I grew up in, and that my mom still lives in, is a slab foundation), my preference is a pier and beam. I would never choose to live on a slab foundation. I would always and forever choose a pier and beam. So glad that you are finally getting you’re house leveled! We had just such an experience on our last home,which was on a slab,and had to be jacked up just on the back only. I believe it was $7000 ,for that,and the money didn’t even go for something pretty! LOL! Carry on,and enjoy the after effects,you will be so happy to get this out of the way! We are in Ohio,and were about to sell when we realized we had this foundation problem. Chomping at the bit to get on with it, are you? Interesting! I’ve never heard of a pier and beam foundation and I have no idea if they have them here in MI or any of the other states I’ve lived. What would be the reason for using them, to save cost? Thanx for the very informative post. Happy for you to get this much awaited milestone out of the way! Pier and beam houses have been used for a very long time here in the U.S. Slab foundations have only been used (at least in my area) since the 50’s. Pier and beam foundations actually cost quite a bit more money to build, and take a lot longer to build. Slabs are cheaper and faster. There are so many advantages to a pier and beam. The link that Susan posted above lists many of the main advantages. Having lived on both a slab and a pier and beam, my preference is definitely a pier and beam. So excited you’re finally able to have this done! Doing a happy dance for you! To those who might look down upon our custom of building homes on a pier&beam foundation, let me just say that there are huge advantages. For one thing, a pier&beam house has a little bit of “give”, which means it’s a little more comfortable than standing on a slab of concrete! (ie, washing dishes, cooking, etc) Pier&beam also sounds different when you walk. I personally love that sound! It gives a home character that no slab in the world can do. 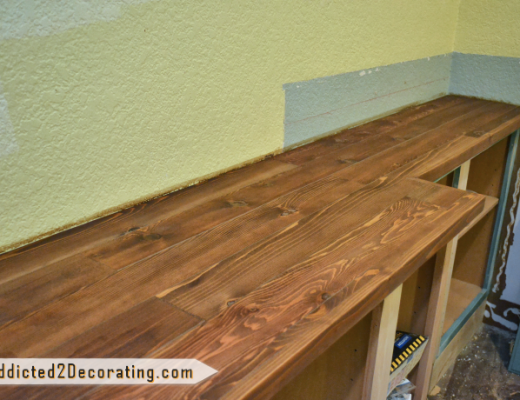 Not to mention the practical reasons – fixing plumbing, wiring, *leveling”, pest control, etc. Congratulations Kristi. Your long awaited day has finally arrived. There will be no holding you back now! Prayers going up that no unexpected problem arise or result. So proud for you! We enjoy pier and beam construction here in Tennessee, also. I don’t ever want to live on a concrete slab foundation. And pier and beam is the only way to put heat and air ductwork under the floor rather than overhead. 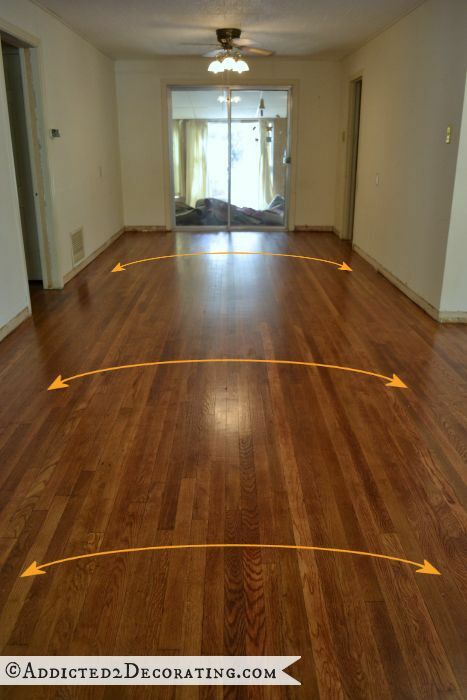 Under the floor is twice as efficient as overhead, and I a fanatic about energy efficiency. I live in Charlotte, NC where this problem is common. It cost us $14,000 twelve years ago to fix it in our brick house (with a partial basement and two stories and attic above!) They still could not get the slope level on the first floor although it is improved. A foundation man told me that the last decade has been awful for homeowners because of the wet years and then the droughts. More business for him! Kristi, I’m so happy for you in finally getting this taken care of so that you can continue moving forward doing what you love and seeing your visions fulfilled. Last night when I went to bed, I thought..hey, tomorrow is leveling day! I am so excited for you. Several people have questions about pier & beam construction….I live in NE Texas and I don’t think you can find a builder that does that anymore. I grew up in a P&B house & I love them. All of the ones around here in the last. 50 years are built on a slab. When those have to be leveled it’s 10k plus. I would love to live in a house built on pier. & beams. Enjoy! When we lived in NC, we bought a house that the builder had somehow completely missed the brick piers when placing the joists- or vice versa, who knows. How the house didn’t have major problems, I don’t know, but we did have extra columns of bricks added to the piers so that the joists were actually resting on something. Anyway, one thing you might want to check is that they put a metal cap between the masonry and the wood joists- a little extra barrier against termites. I’m watching a show from Waco on HGTV now and the host/contractor showed a house with your exact issue. He pretty much said the uneven floors were no big deal, could easily be leveled. Said it just happens and you fix it. Just a regional thing that you deal with. it is all so exciting. i can’t wait for what you dream up next. LOVE your blog. It’s Saturday afternoon here in Ireland and I’m DYING to know how things went yesterday! I was sending good vibes your way the whole of yesterday, so I hope they were useful. Am really looking forward to your post on Monday Kristi!! Things went great!! 🙂 They didn’t quite get finished yesterday, so they’ll be back this morning to finish up the living room, music room, and kitchen. (It’s 7:09am as I write this, and I think they’ll be here about 8:00am). They’ll do the living room today, so hopefully I’ll see the same results on the fireplace wall so that it will also sit against the wall from the bottom to the top, rather than leaning away from the wall like it does in the picture above. Leveling buildings is not just a southern thing. Homes all over the country (and probably the world) have to be leveled depending on the kind of soil they are built on. We lived for many years in an old farmhouse with a dirt and rock foundation. There really wasn’t anyway to keep a 100+ year old home level in that kind of foundation, other than putting a whole new foundation under it. It was very cost prohibitive. Needless to say, when we moved into our ranch, I was thrilled that it was still in great shape as far as any leveling concerns go. 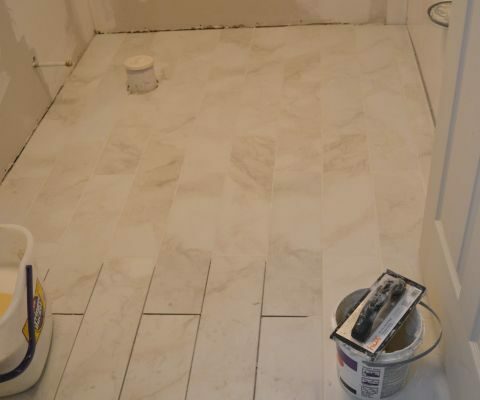 I hope the leveling process went well for you yesterday and that you can start doing the other remodeling projects you have put off until that was complete. I never would have known about a lot of this until reading your Blog! Very interesting! I know this post was from several years ago but thank you so much for the detailed information! We purchased a pier and beam foundation house about a year ago and are in the midst of (slowly) renovating it. I’m in a similar situation to you in that I’ve been in a holding pattern on several projects until the uneven floors are fixed. Most of the houses in my area are on slab foundations so very few people can offer any advice on this issue. After reading your explanation of the process I’m feeling much better about the idea of leveling the house. I’ve already contacted a few contractors for estimates so I can finally get this project started.